iPhone – Add the Return Key for UIKeyboardTypeNumberPad | Eureka! Update @ 2012-11-10: This solution in this post is outdated. please refer to the comment made by Jonny for the solution in iOS 6. When you try to use the UIKeyboardTypeNumberPad for a UITextField, you will release that there is no return key and so the UIKeyboardTypeNumberPad cannot be dismissed. Luckily, i find out a very good article which talk about the solution of the missing return key. 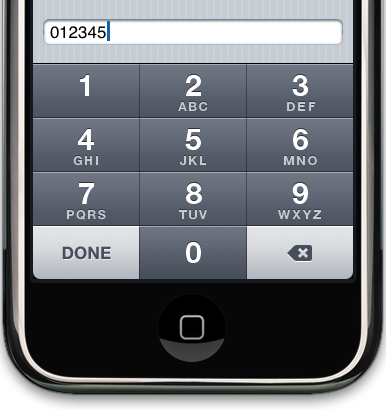 It makes use of the NSNotification and NSNotificationCenter such that a DONE button image will pasted on the bottom left of the UIKeyboardTypeNumberPad. Here is the code for returning from the number pad after editing a UITextField. *Update on 2010-09-11: The approach does not work in iOS SDK >= 4.0. if your are using 4.0, you can take a look at iPhone – Add the Return Key for UIKeyboardTypeNumberPad in iPhone SDK 4. You can dismiss the UIKeyboardTypeNumberPad now. You can save the DoneUp.png and DoneDown.png in the following Reference link. It looks like this method is broken in iPhone OS4 Beta 3. I haven’t come across a solution yet. i haven’t tried it on iPhone OS4 neither. Let’s see if there is solution later.